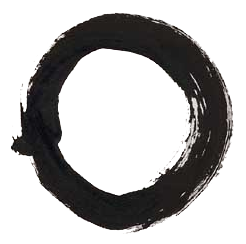 In calligraphy, Zen Buddhism represents the great Void (Sunyata) by the circular enso symbol. Śūnyatā, शून्यता (Sanskrit meaning "Emptiness" or "Voidness"), is an important Buddhist teaching which claims that nothing possesses essential, enduring identity because everything is interconnected in a chain of co-becoming and in a state of constant flux. In various schools of Buddhism, Śūnyatā is a key concept used to express that everything one encounters in life is empty of absolute identity, permanence, or an in-dwelling 'self' because everything is inter-related and mutually dependent—never wholly self-sufficient or independent. The importance of this insight is especially emphasized in Mahayana Buddhism. Widely misconceived as a doctrine of nihilism, the teaching on the emptiness of persons and phenomena is unique to Buddhism, constituting an important metaphysical critique of theism with profound implications for epistemology and phenomenology. In the English language, the word emptiness suggests the absence of spiritual meaning or a personal feeling of alienation, but in Buddhism the realization of the emptiness of phenomena enables liberation from the limitations of form in the cycle of uncontrolled rebirth. Sunyata is a Sanskrit noun that derives from the adj. sūnya - 'void', Suññatā (Pāli; adj. suñña), stong pa nyid (Tibetan), Kuu, 空 (Japanese), Gong-seong, 공성(空性) (Korean), and qoɣusun (Mongolian). Śūnyatā holds the semantic field of "emptiness" and is the noun form of "Shunya" (Sanskrit), which holds the semantic field "zero," literally zero "ness." The theme of śūnyatā emerged from the Buddhist doctrines of Anatta (nonexistence of the self) and Pratitya-samutpada (Interdependent Arising). The Suñña Sutta, part of the Pali Canon, relates that the monk Ananda, the attendant to Gautama Buddha asked, "It is said that the world is empty, the world is empty, lord. In what respect is it said that the world is empty?" The Buddha replied, "Insofar as it is empty of a self or of anything pertaining to a self: Thus it is said, Ananda, that the world is empty." After the Parinirvana of the Buddha, Śūnyatā was further developed by Nagarjuna and the Madhyamika school. Śūnyatā is also an important element of the Tathagatagarbha literature, which played a formative role in the evolution of subsequent Mahayana doctrine and practice. It should be noted that the exact definition and extent of shunyata varies within the different Buddhist schools of philosophy which can easily lead to confusion. These tenet-systems all explain in slightly different ways what phenomena 'are empty of', which phenomena exactly are 'empty' and what emptiness means. For example, in the Cittamatra school it is said that the mind itself ultimately exists, but other schools like the Madhyamaka deny this. In the Mahayana Tathagatagarbha sutras, in contrast, only impermanent, changeful things and states (the realm of samsara) are said to be empty in a negative sense—but not the Buddha or Nirvana, which are stated to be real, eternal and filled with inconceivable, enduring virtues. Moreover, the Lotus Sutra states that seeing all phenomena as empty (sunya) is not the highest, final attainment: the bliss of total Buddha-Wisdom supersedes even the vision of complete emptiness. According the Madhyamika, or Middle Way philosophy, ordinary beings misperceive all objects of perception in a fundamental way. The misperception is caused by the psychological tendency to grasp at all objects of perception as if they really existed as independent entities. This is to say that ordinary beings believe that such objects exist 'out there' as they appear to perception. Another way to frame this is to say that objects of perception are thought to have svabhava or 'inherent existence'—'own being' or 'own power'—which is to say that they are perceived and thought to exist 'from their own side' exactly as they appear. In this light, sunyata is the concept that all objects are Empty of svabhava, they are Empty of 'inherent existence'. Therefore, emptiness refers to Emptiness of inherent existence. The Buddhist concept of Emptiness is a very subtle concept. In the Mūlamadhamaka kārikas Śūnyatā is qualified as "...void, unreal, and non-existent." Rawson states that: "[o]ne potent metaphor for the Void, often used in Tibetan art, is the sky. As the sky is the emptiness that offers clouds to our perception, so the Void is the 'space' in which objects appear to us in response to our attachments and longings." However, 'Emptiness' is not the same as 'Nothingness', a mistake which is often made. Emptiness does not negate the play of appearances which manifest to a multitude of sentient beings, it asserts that they are insubstantial. "One of the most important philosophical insights in Buddhism comes from what is known as the theory of emptiness. At its heart is the deep recognition that there is a fundamental disparity between the way we perceive the world, including our own experience in it, and the way things actually are. In our day-to-day experience, we tend to relate to the world and to ourselves as if these entities possessed self-enclosed, definable, discrete and enduring reality. For instance, if we examine our own conception of selfhood, we will find that we tend to believe in the presence of an essential core to our being, which characterises our individuality and identity as a discrete ego, independent of the physical and mental elements that constitute our existence. The philosophy of emptiness reveals that this is not only a fundamental error but also the basis for attachment, clinging and the development of our numerous prejudices. According to the theory of emptiness, any belief in an objective reality grounded in the assumption of intrinsic, independent existence is simply untenable. All things and events, whether ‘material’, mental or even abstract concepts like time, are devoid of objective, independent existence." Śūnyatā is a key theme of the Heart Sutra (one of the Mahayana Perfection of Wisdom Sutras), which is commonly chanted by Mahayana Buddhists worldwide. The Heart Sutra declares that the skandhas, which constitute our mental and physical existence, are empty in their nature or essence (i.e., empty of any such nature or essence). It also declares that this emptiness is the same as form (which connotes fullness)—i.e., that this is an emptiness which is at the same time not different from the kind of reality which we normally ascribe to events; it is not a nihilistic emptiness that undermines our world, but a "positive" emptiness which defines it. The stance that no contingent entity has any inherent essence forms the basis of the more sweeping 'sunyavada' doctrine. In the Mahayana, this doctrine, without denying the value to things, denies any essence to even the Buddha's appearance and to the promulgation of the Dhamma itself. For Nāgārjuna, who provided the most important philosophical formulation of śūnyatā, emptiness as the mark of all phenomena is a natural consequence of dependent origination; indeed, he identifies the two. In his analysis, any enduring essential nature would prevent the process of dependent origination, and indeed would prevent any kind of origination at all, for things would simply always have been and always continue to be. This enables Nāgārjuna to put forth a bold argument regarding the relation of nirvāna and samsāra. If all phenomenal events (i.e., the events that constitute samsāra) are empty, then they are empty of any compelling ability to cause suffering. For Nāgārjuna, nirvāna is neither something added to samsāra nor any process of taking away from it (i.e., removing the enlightened being from it). In other words, nirvāna is simply samsāra rightly experienced in light of a proper understanding of the emptiness of all things. The class of Buddhist scriptures known as the Tathagatagarbha sutras presents a seemingly variant understanding of Emptiness. To counteract a possible nihilist view, these sutras portray emptiness of certain phenomena in a positive way. The "tathagatagarbha" (Buddha-womb) of which these sutras speak, does not represent a substantial self (atman); rather, it is a positive language expression of emptiness and represents the potentiality to realize Buddhahood through Buddhist practices; the intention of the teaching of 'tathagatagarbha' is soteriological rather than theoretical. In the Srimala Sutra, the Buddha is seen as empty of all defilement and ignorance, not of intrinsic Reality. The Mahayana Mahaparinirvana Sutra supports such a vision and views Ultimate Emptiness as the Buddhic cognition ("jnana"), which perceives both Emptiness and non-Emptiness, wherein "the Empty is the totality of Samsara and the non-Empty is Great Nirvana." The Buddha in the Mahayana Mahaparinirvana Sutra, further, indicates that to view absolutely everything as empty is an unbalanced approach and constitutes a deviation from the middle path of Buddhism. Moreover, this particular sutra contains a passage in which the Buddha castigates those who view the Tathagatagarbha (which is the indwelling, immortal Buddha-element) in each being as empty. The sutra states how the Buddha declares that they are effectively committing a form of painful spiritual suicide through their wrongheaded stance like a "moth in the flame of a lamp." The attainment of nirvanic Liberation ("moksha"), by contrast, is said to open up a realm of "utter bliss, joy, permanence, stability, [and] eternity," in which the Buddha is "fully peaceful." Thus, in the distinctive Tathagatagarbha sutras a balance is drawn between the empty, impermanent and coreless realm of samsara and the everlasting, liberative Reality of the Buddha and Nirvana. The Lotus Sutra (Ch. 4) likewise suggests that seeing all things as empty is not the ultimate Buddhic realisation, not the final "gain" or "advantage": Buddha-Wisdom is indicated there to transcend the perception of emptiness. This teaching never connotes nihilism—nihilism is, in fact, a belief or point of view that the Buddha explicitly taught was incorrect—a delusion, just as the view of materialism is a delusion. Roger R. Jackson writes, "In order to obviate nihilism, ... mainstream Mahayanists have explained their own negative rhetoric by appealing to the notion that there are, in fact, two types of truth (satyadvaya), conventional or "mundane superficial" (lokasamvriti) truths, and ultimate truths that are true in the "highest sense" (paramartha)." In the words of Robert F. Thurman, "... voidness does not mean nothingness, but rather that all things lack intrinsic reality, intrinsic objectivity, intrinsic identity or intrinsic referentiality. Lacking such static essence or substance does not make them not exist - it makes them thoroughly relative." This relativity of all phenomena contrasts to materialism, the notion that phenomena exist in their own right, in and of themselves. Thus, the philosophy of the Buddha is seen as the Middle Way between nihilism and materialism. ↑ De la Valée Poussin (ed. ), Mūlamadhamaka kārikas, in Bibliotheca Buddhica, 1913. ↑ Rawson, 1991, p. 11. ↑ Dalai Lama, The Universe in a Single Atom: The Convergence of Science and Spirituality (Broadway, 2005, ISBN 076792066X, ISBN 978-0767920667). ↑ Heng-Ching Shih, "The Significance Of 'Tathagatagarbha'—A Positive Expression Of 'Sunyata'" Retrieved July 18, 2008. ↑ Jackson, 1993, p. 58. ↑ Lex Hixon, Mother of the Buddhas (Quest Books, 1993, ISBN 0-8356-0689-9). Bhikkhu, Thanissaro (trans.). SN 35.85, Suñña Sutta, Empty Access to Insight, 1997. Boruah, Bijoy H. Atman in Śūnyatā and the Śūnyatā of Atman South Asia Seminar, University of Texas at Austin, 2000. Hurvitz, Leon (trans.). Scripture of the Lotus Blossom of the Fine Dharma (The Lotus Sutra). Columbia University Press, 1976. Page, Tony (ed.). The Mahayana Mahaparinirvana Sutra Nirvanasutra.org, 2004 . This page was last modified on 28 October 2015, at 14:14.